Costa Mesa real estate company Torelli Realty provides useful news & tips for Costa Mesa homes. -Typically when homeowners make long-lasting home improvements, it indicates that homeowners intend to remain in the home for a longer term. Home values tend to be higher in established areas. -Homes with quality improvements stage better and have the most “wow-factor” when they hit the real estate market. For example, one of our newest Costa Mesa homes for sale in South Coast Metro has made all the right choices in terms of home upgrades. -Homeowners are always told to put their money into their kitchens and baths. So spending $4,500 on stainless steel appliances is a smart move. For a home of this size, stainless steel appliances are the standard that most buyers would expect or desire because they are durable and sleek. The cost is a bit higher than standard black or white appliances however this investment is one that is worth the cost. -For just under $13,000, the homeowners updated two bathrooms with classy finishes. According to Remodeling Magazine’s Cost vs. Value Report 2009-2010 the average midrange bathroom remodel in Southern California cost $18K. It follows that 2 bathrooms would normally run about $36K. These bathroom projects combined cost nearly 1/3 of that amount! The look of the bathrooms is classic and the quality of the materials reflects that style. -For $5,500 the homeowners installed custom porcelain Italian flooring throughout. The sleek design is modern and complements the architectural features in the home. The cost spent was comparable to the amount it would cost to lay hardwood floors. Yes, it was more expensive than carpet however tile is a feature that adds value to a home. The material is long-lasting and will be a hit with buyers. -For $5,400, baseboards were added to every room, crown molding was added to all the bedrooms, and the kitchen was given a coffered ceiling. The finished look of all these room is worth every penny of this investment. The amount spent is reasonable for a house with nearly 2,000 square feet. These fine touches show pride of ownership and create wow factor. -The homeowners spent $10,500 installing Milgard double-pane low-e windows and sliding doors throughout the entire home. This improvement packs a triple punch. First of all, homeowners can’t go wrong with replacing windows and doors for homes because they are an essential part of the home. Also, the owners chose a high-quality brand. Finally by picking energy-efficient windows and doors the home will be more energy efficient and help to keep utility costs lower over the long term. -For $4,400 recessed canned lighting was installed in all the bedrooms, baths, and kitchens. For that price they put in 40 lights! An upgrade like this may not seem like a big deal however it’s a great way to add value. Recessed lighting helps to brighten up the space and is a stylish look. These are just some of the remodeling projects that the homeowners in South Coast Metro tackled before listing their home for sale. If you want to check how your home improvements can affect the value of your home, it’s a good idea to check with your local Realtor who understands the market conditions. On Zillow, there is a cool feature that allows homeowners to update the improvements and features of their home and see how that impacts the value. Again, a local Realtor can give you a more subjective analysis however it’s key to note that a website like Zillow supports the fact that home improvements do alter the value of homes. Every landlord wants to provide a rental home that will yield a high return on investment. Improvements do need to be made quite frequently in a rental and one of the biggest priorities is flooring. We’ve often suggested affordable carpet, Pergo or laminate wood floors for a clean look that’s easy to maintain and cost-effective. Find our some more details and ideas in this informative article. Remember that the type of material to use does vary depending on the size and market of the home. For example in our market, Costa Mesa apartments might want to use carpet and luxury homes in Newport Beach may use expensive looking tile (which doesn’t have to break the bank!). Orange County rentals can be a profitable business and the best way to maximize profit is to make strategic property management choices. About Torelli Realty: Based in Costa Mesa, California, Torelli Realty has been providing Costa Mesa real estate services since 1984. The real estate company helps people buy and sell Costa Mesa homes, as well as homes in Huntington Beach, homes in Newport Beach, and covers the entire Orange County real estate market. Torelli Realty also provides services in: property management, rentals, home staging, and more. When getting a house ready for the real estate market, we advise clients on how they can get top dollar. In most cases there are some easy, cost-effective tricks to spice up your home. Here are a couple of budget-friendly home improvements we just suggested for one of our Costa Mesa homes for sale. 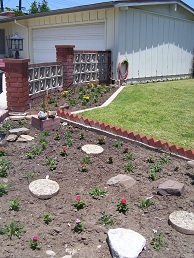 Remember, curb appeal creates the first impression for a buyer. 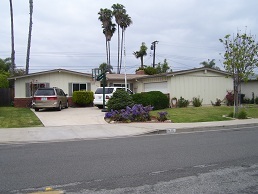 This Costa Mesa home was surrounded by overgrown bushes that blocked the home from the street. 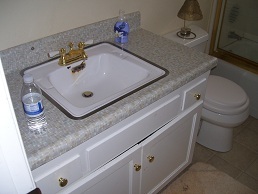 The bathroom vanities were original 1950s Formica with plain wood doors that were difficult to keep closed. Given that other homes in this Costa Mesa neighborhood have been updated, we know that buyers will be quick to compare this home to others so it’s necessary to upgrade them. For about $1500, the vanities have been given a modern update. 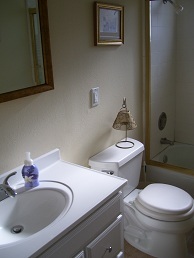 To give the bathrooms a fresh look it is not necessary to go overboard when you remodel to sell. A simple, updated look is all it will take to keep buyers interested. Add a nice shower curtain and give the bathroom a good cleaning and you’ve got yourself a bathroom that will impress buyers and help you get top dollar for your home. When listing your home for sale, it’s important to realize that there are simple home improvements and home staging tips that sellers can use to get top dollar. Why not spend a few hundred dollars to get a higher sales price? If you have any questions about how to improve your home to get top please email our real estate experts and home staging expert with HGTV experience. You may submit a video question to show us the room or project in question too! 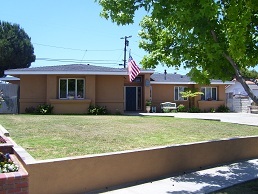 Many Costa Mesa homes are 1950s tract homes. Drive through the streets of Mesa Verde, Mesa Del Mar, Halecrest, Mesa North, College Park… The majority of Costa Mesa houses were built during the building boom of the 1950s. We recently saw a question & answer piece in Inman News where an anxious homeowner wrote in asking for tips about how to update the design of their 1950s home. Since this is a question our Costa Mesa Realtors are often asked, we’d like to suggest some ways to redesign a tract home and add major curb appeal. 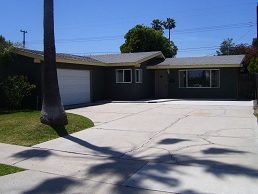 Costa Mesa home for sale for $505K. More info here. -Give your home a fresh coat of paint. What color, you ask? Drive around your neighborhood and pick out homes that fit your taste. Most of the homes around you are probably similar in style so this is a good way to see what looks right and what doesn’t look right (in your eyes). Take your time and make sure you are tied to the color since it’s going to be a big, fairly permanent change. Don’t forget to choose a trim color that complements the house color. -Play around with color swatches and even online photo programs. Some high end paint stores will have interactive tools where you can mix and match paint colors. You can even do this on the Internet or with some computer programs. (Just a head up, there may be a fee with some of these programs). -It’s ok to look at homes that aren’t the same age and style as your home to get ideas. Often times people vibe with more modern colors and designs that are common among homes in newer neighborhoods. 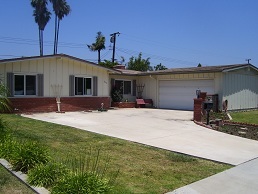 The beauty of a 1950s tract home is that these homes tend to be pretty basic since they were built quickly. The same is true with many of the more recent tract homes and if you these colors on your older home, you can easily add a contemporary, sophisticated look to your home. Driving through the neighborhoods of Costa Mesa with homes from the 1950s, it’s interesting to see the various materials that builders used to jazz up the homes. For instance many homes have wood paneling on the exterior that you don’t see everyday. Some people enjoy the charm of the woodwork, others do not. We’ve seen many homes simply paint the wood to conceal it and it looks beautiful. This is such an easy fix that truly updates the look of our Costa Mesa homes. Many of these principals can be applied to landscaping updates as well. Our Costa Mesa Realtors are happy to assist you in making decisions about how to update your Costa Mesa home and maximize your home’s value. Our real estate agents have great professional service contacts as well. We know Costa Mesa real estate and all of its intricacies since we’ve been doing business here since 1984.